It has always worried me that pollution in the air affects the environment in many ways. 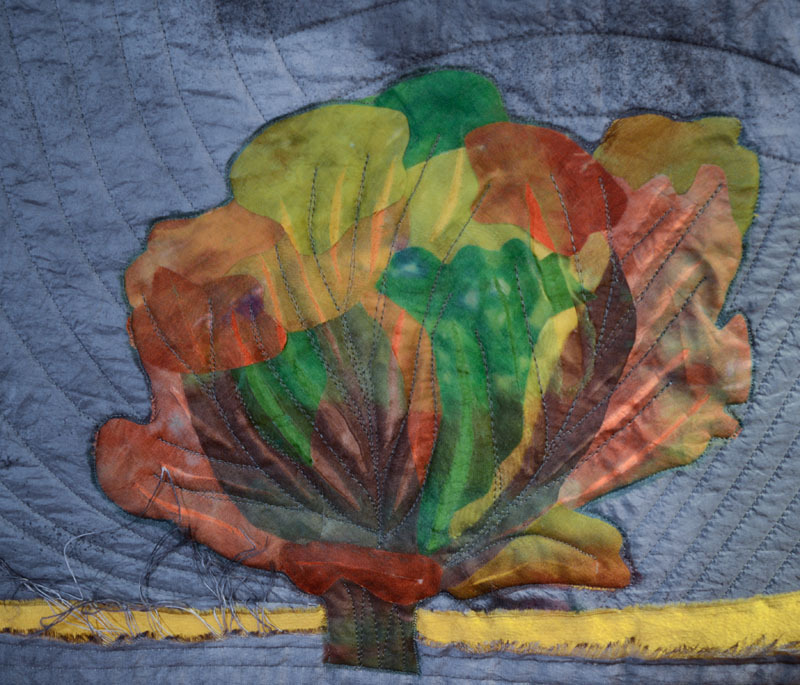 In this piece I have endeavored to show how pollution dulls Autumn colours. The inspiration for my tree comes from a Paul Klee painting. To dull the atmosphere I have place organza over the bright silk of the tree and slashed it in areas to allow the underneath colour show through. The sun is a circle of silk foiled with gold. 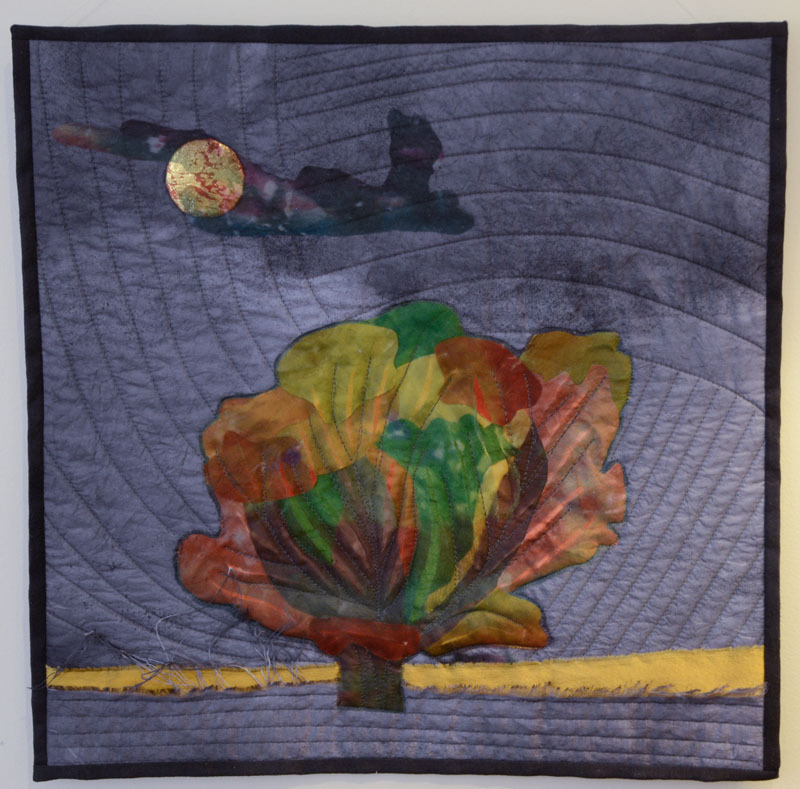 I used hand dyed Dupion silk and over dyed the sky area to depict pollution descending through the atmosphere. What a great idea for this theme Kaylene, we are so lucky to still live in a pollutant free area. Like the slashing revealing the glimpses of true colour. Well done. I agree with Diana: a great idea. I love the way how you did put together your tree and the colors you used for it. A powerful image, Kaylene. Living out here on the Canadian prairie, under a wide, clear sky, I am moved by your depiction of the alternative, what happens when areas are over-industrialized. Thank you. A very thoughtful subject and the use of organza is an effective way of producing the right amount of ‘dullness’ in your colours. Cunning use of shading, very effective…. The overdyed background is a wonderful way to portray something such as pollution that cannot be readily seen. Your technique for the tree does show a less bright fall than one thinks of. 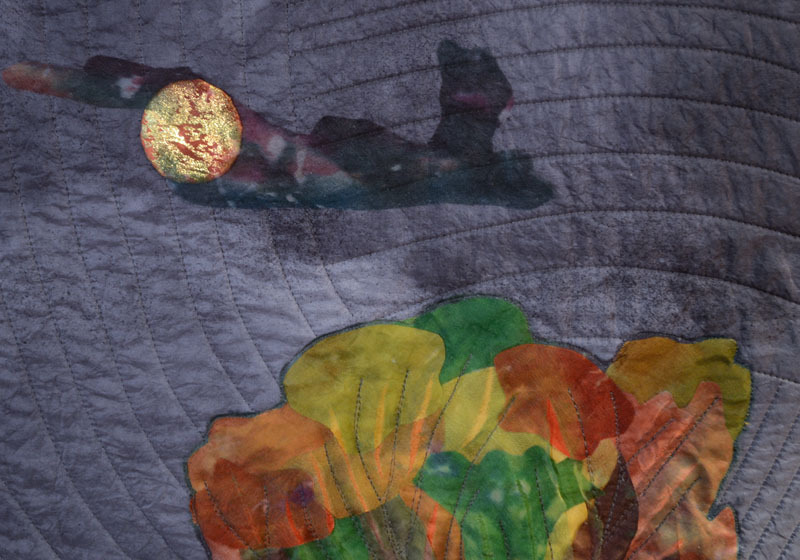 The background quilting really provides movement and is reminiscent of fall winds blowing around swirling leaves. So nice how you used organza to create the dull colors.